Low fat cheeses have come a long way since 1993. That’s probably how long it had been since I had tried them. It wasn’t until my husband needed to severely cut his fat intake that I went searching through deli after deli for types that he would be able to enjoy. For the most part, he has been eating a very low fat white cheddar, which he loves, and mozzarella string cheese, the kind they individually wrap for kids, but I was pleasantly surprised to stumble upon low fat feta. What do you do with feta, besides making spanakopita, which I would die for right about now? 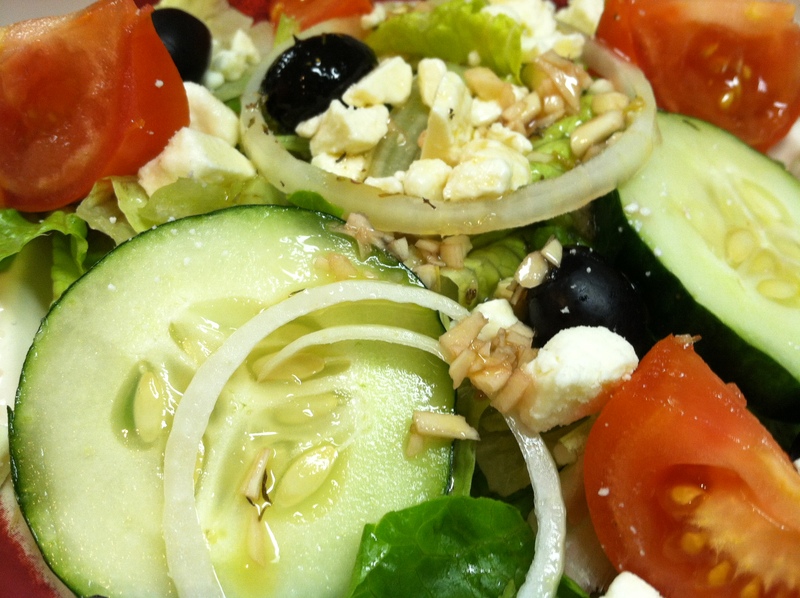 Greek salads, of course. On one of our date nights last week, we were lucky enough to have two thanks to the fact that our boys’ social functions have increased with their ages, we went searching for something to make the following night that would remind us of dishes we would have enjoyed together before the big change in our eating habits. When I found the cheese, we knew exactly what we wanted. Our favorite local pizzeria, Frank’s, offers a family meal deal that comes with two Greek salads and a large pizza with drinks for four. My husband and I usually share the salads with the kids, if they are in the mood, and sit laughing while they try to have a “who can hold the pepperoncini in their mouth longer contest.” We love Greek salads and it is the feta and olives that make them so delicious. So off we went around the store gathering the items we needed to make them just right. Cured olives were out of the question if we wanted to keep the salads low sodium as well as low fat, so we went with good old canned black olives. Tomatoes, cucumbers, and onions were all we needed to make the salads satisfactory. Pepperoncinis are also too salty for my husband, so we didn’t bother looking for them. The next evening I threw the salads together and made a simple vinaigrette to dress them with and we were off to the races. Yes, we did miss the pizza, but there was feta cheese! My glass was half full. 1/2 tsp. dried thyme. Fresh would have been better but my window garden planter full of thyme is still recovering from being over-nipped the weekend I made Middle Eastern food. Salt & pepper to taste, optional.